This summer saw the end of Christopher Nolan’s version of Batman with the “The Dark Knight Rises.“The last chapter of this Batman trilogy told the story of Batman’s return to Gotham, as the Cape Crusader battled the villain known as Bane to determine the fate of the City. The film raked in over $1 billion at the box office. During the past few weeks we’ve been hearing rumors regarding the release of “The Dark Knight Rises” on DVD and Blu-ray. Now Entertainment Weekly is reporting that they have confirmed the film will be released on DVD and Blu-ray December 4th – just in time for Christmas. There will also be a Batman limited edition Blu-ray combo pack available. The combo pack is said to include an enormous variety of extra features. ComingSoon.net says the Blu-ray pack will include “The Journey of Bruce Wayne”, a Batmobile documentary, plus an in-depth look with approximately 17 featurettes detailing how Nolan and his production team made The Dark Knight Rises. No clear word yet on what special features the DVD version will include. 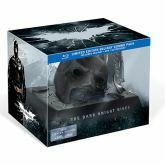 The limited edition Blu-ray Pack will also include a replica of Batman’s broken mask.